Adventures in Homebrewing (AIH) is a brewing supply store located in Southeast Michigan. They offer a full range of homebrewing products, including equipment and ingredients. I learned about them relatively recently through sales they were doing that the brewing bargain site Homebrew Finds shared. I decided to check out their Gingerbread Brown Ale kit and their Peanut Butter Conspiracy Stout kit, as both were on sale at the time (priced around $27 each). AIH shipped the kits very quickly. I had them only a few days after I ordered them. They were packaged well and made the trip without harm. Since it's the summer, I opted for dry yeast with these as there was a good chance that standard yeast packets or tubes would get too warm in shipping. 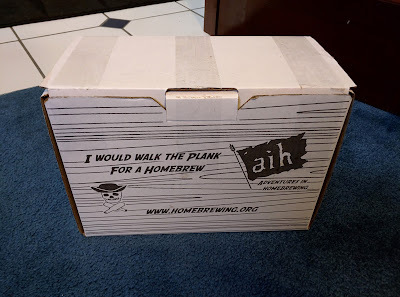 The kit arrives in a small box, imprinted with the AIH logo and slogan "I would walk the plank for a homebrew" in back. All of the required ingredients were present in my box. I added to the above a Whirlfloc tablet (to help keep the beer clear) and a few drops of Fermcap S during the boil (to prevent boil-over). Although AIH's instructions are based on a 2.5 gallon boil, chose to do a full five-gallon boil on this one just to prevent contamination from using tap water to fill the fermenter to five gallons. 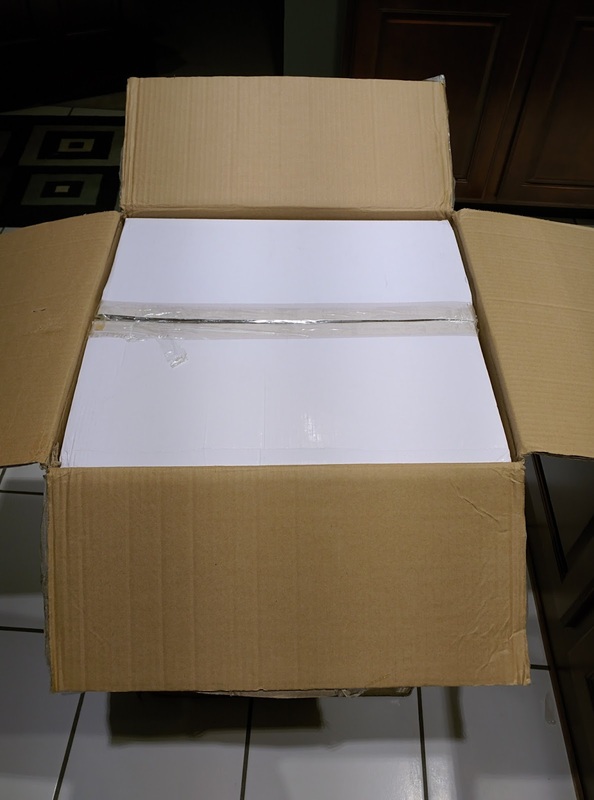 It's worth noting that the instructions found online and those packed in the box differ. 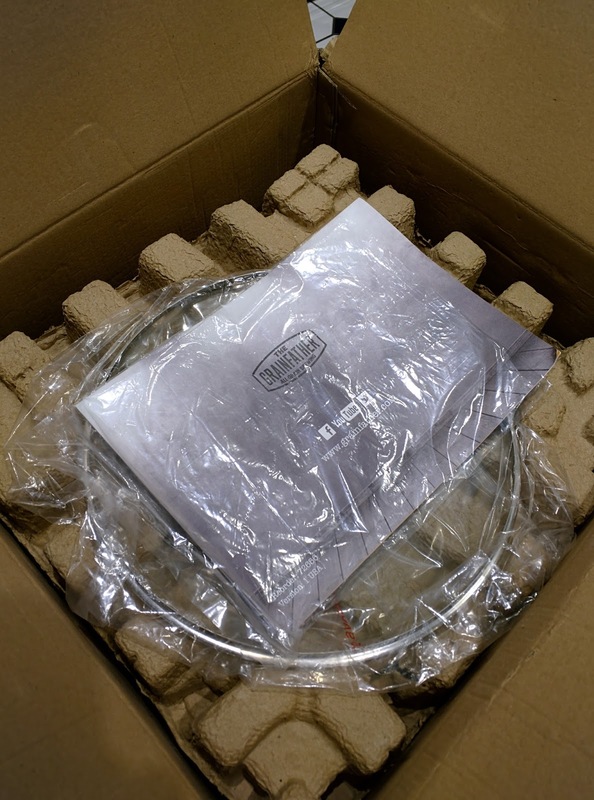 The online instructions show 7 pounds of LME rather than 6. Both show no hops in the ingredient list, but there actually are hops included in the kit (4 HBUs worth, it says on the package). The hops are specified only as "4 HBUs" worth. I weighed mine at 0.4 ounces, which some reverse engineering with Beer Tools Pro says makes them probably a 12% alpha acid variety. I used my standard home brewing setup. 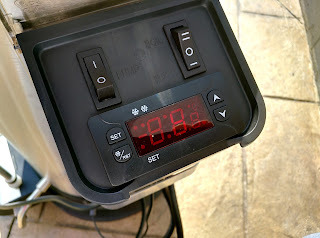 The kettle is an 8-gallon Mega Pot 1.2 with thermometer and valve installed. The heat source is our Samsung kitchen stove, which as you'll see later provides more than enough heat to bring 5 gallons to a boil. The wort chiller is a Steel Serpent. Hops were infused with a steel mesh ball purchased on Amazon.com. 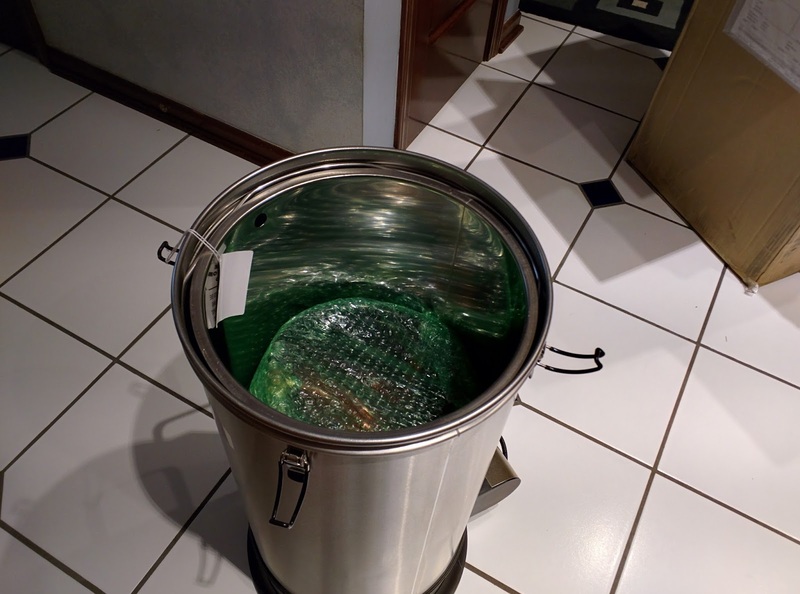 The fermenter is a plastic bucket model from Midwest Supplies. (I plan to upgrade that to an SS Brew Tech Brewmaster Bucket soon, but for now it's the plastic model, which has served me well so far.) I'll use a generic airlock filled with Star San on the fermenter. Original Gravity will be measured using an automatic temperature correcting (ATC) refractometer. The instructions tell you to heat 2.5 gallons of water to 150-160 degrees Fahrenheit and steep the grain bag in it for 20 minutes. 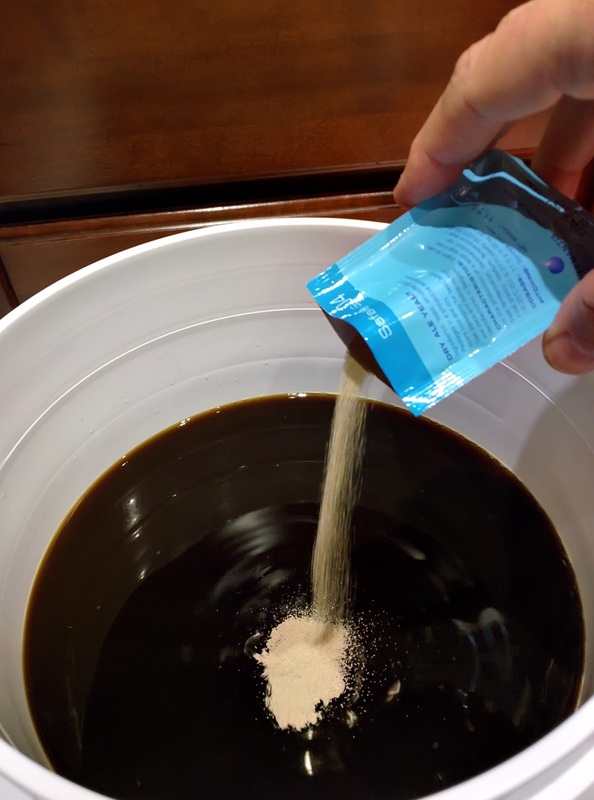 After that, remove the grain bag and allow the liquid to drain into the kettle without squeezing the bag (which could release tannins that damage the beer's flavor). 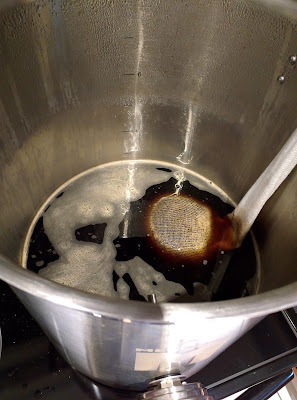 Bring the wort to a boil, then remove from the heat. Add the LME and return it to a boil. After LME addition, kettle returned to heat and brought to a boil. Fermcap S can make during your boil. I've used it for the last 3 batches and plan to continue. It's also worth noting that I added my hops ball with the provided hops before the boil began. I'd like this beer to have enough bitterness to offset the malt, but not so much as to compete with the spices. 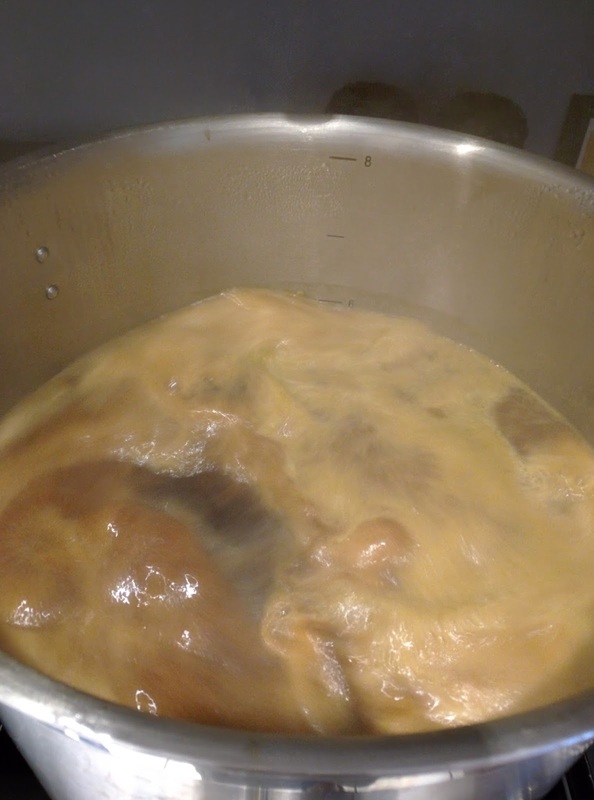 I've heard that adding the bittering hops prior to the boil can reduce the "bite" they impart without reducing the bitterness. We'll see how that turns out. At the 45-minute mark in the boil, I added yeast nutrient and a Whirlfloc tablet, as I like to give the yeast everything they need and make sure the finished beer is as clear as I can brew it (for styles where haze isn't expected). 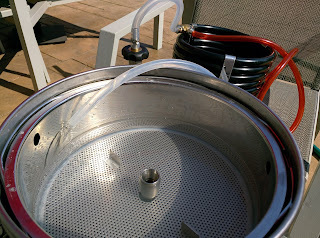 I also inserted my wort chiller to sterlize it before cooling began. Knowing that my kettle (and electric stove for that matter) tends to hold on to heat very well, I actually turned off the stove at the 5-minute mark. The wort actually had a rolling boil until two minutes were left in the 60, and stayed at 210 degrees+ until I started up the chiller. According to the instructions in the box, original gravity should be 1.045. My refractometer read 1.048 or 12 Brix, despite having the correct final volume of 5 gallons. I think my brewhouse efficiency is a little higher than expected by the makers of ingredient kits, as I'm often a few points higher than the recipe. Regardless, this isn't a significant enough different to warrant watering the beer down and potentially contaminating it, so I left it alone. After the 60-minute boil, the wort should be chilled to 70 degrees Fahrenheit and transferred to the fermenter. I did this using my Silver Serpent chiller, tap water augmented with reusable ice packs, and an aquarium pump (since my current sink faucet doesn't have a threaded end). When the wort got down to 80 degrees, I transferred it to my fermenter using gravity and a length of flexible tubing. I then oxygenated the wort with my oxygen tank and stone for 40 seconds. When the temperature reached a safe level for the yeast I'm using, I sprinkled the provided packet of Safale S-04 yeast on top and gave the concoction a stir with a sanitized spoon. Between the oxygenation and the yeast nutrient, there is no reason this beer shouldn't ferment to its intended final gravity. 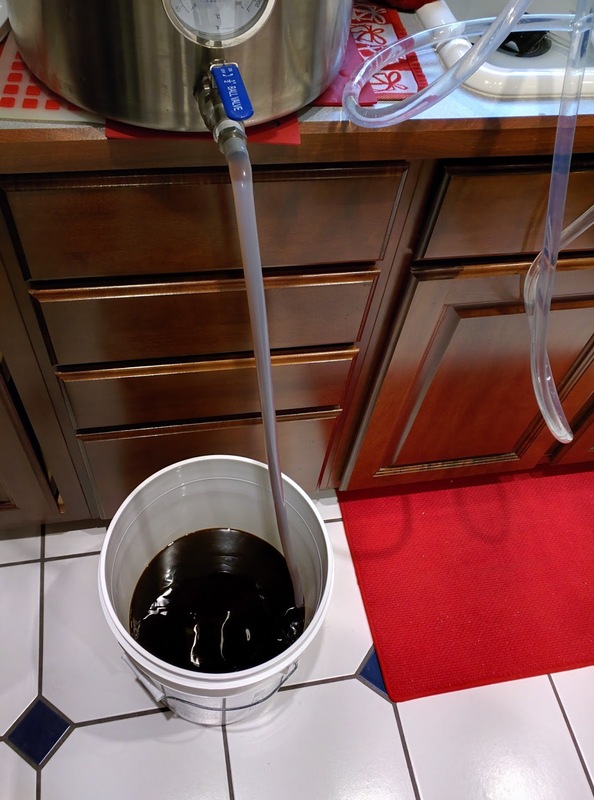 The instructions say that primary fermentation is complete when the beer reaches its Final Gravity of 1.009 or 2.3 Brix. I reached that gravity a few days in, but allowed the beer to continue fermenting for a full week. Then I took the gingerbread spice packet and soaked it in Everclear for 30 minutes before adding it into the fermenter. It will probably shock many readers, but I stopped racking my beers out of the primary fermenter some time ago. I'd read an article indicating that with today's high-quality ingredients, yeast, and equipment, it wasn't as critical as it was some time ago. Each time you rack beer from one location to another, you run the risk of infection. The transfer device or tube might be infected with yeast or bacteria. The new fermenter might be infected. Any air that the beer passes through might be infected. The article indicated that people couldn't tell the difference between beer that had been racked and beer that hadn't. I tested on a batch or two and agreed with them. It may be detectable for some brewers, some recipes, and some sets of conditions, but it wasn't for me. After four days, I took a refractometer reading from the beer. It registered 6 Brix, which (due to the presence of alcohol in the beer and the design of my refractometer) worked out to an adjusted reading of 1.009 Standard Gravity. That's the target for this beer, per the instructions. I allowed the beer to finish seven days in the fermenter. On that day, I mixed the ingredients of the spice packet with a neutral liquor and allowed the spices to steep in the liquor for 30 minutes before adding the whole mixture into the beer. I left the spices in the beer for eight days before bottling. AIH doesn't provide bottling instructions, other than "Proceed to bottle/keg, following appropriate procedures" which for an experienced home brewer like me is more than enough information. A beginner might need to look up the process online or ask a friend. Having done a batch a month (on average) for a while now, that wasn't an issue for me. The nearly-finished beer had a nice gingerbread spice aroma. The flavor seemed rather bland to me. It wasn't overly spicy, wasn't malty or thick, and wasn't hoppy. It wasn't unpleasant, either. It was just "kind of OK" to me. I made a detour from the AIH instructions at this point. 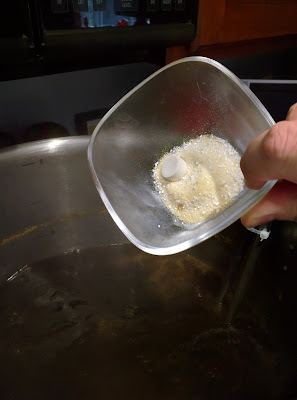 Instead of using the provided corn sugar to bottle the beer, I used some D-90 Candi Syrup instead. I'd hoped this dark syrup might contribute some additional flavors during bottling to improve the complexity of the brew. I measured out 162 grams of candi syrup, added 80 grams of water to it, brought that to a boil, and boiled for five minutes. This was cooled down and added to the bottling bucket. A large sanitized spoon was used to mix the syrup into the beer before bottling. Yield for this particular batch was twelve 22-ounce bomber bottles and twenty-two 12-ounce bottles. That works out to about 4.13 gallons from the 5-gallon batch. That should give you some idea how much trub had accumulated in the bottom of the fermenter from the very active fermentation. Compared to a Brewer's Best kit, I found the AIH kit a little easier to work with. AIH provides a grain bag with the grain in it, but sealed in plastic for freshness. This made it easy to steep the grains. All I had to do was heat the water, drop in the bag, monitor the temperature, and wait. With a Brewer's Best kit, I'd need to provide my own bag and put the grain in that. My biggest complaint was that the hops pellets in the kit arrived almost pulverized, and wound up leaving a layer of green "scum" on top of the brew kettle that I had to skim off before transferring the wort to the fermeter. It was also odd that the grain shipped in a bag, but the hops pellets shipped loose. Shipping those in a bag would have been a nice touch. AIH separates the ingredients into groupings you're going to be using together, which makes it easy to lay things out and keep them in logical groups while brewing. The AIH brewing instructions are adequate for all but the most inexperienced home brewers. (To see them, click the Instruction Sheet link in the ingredient list above.) 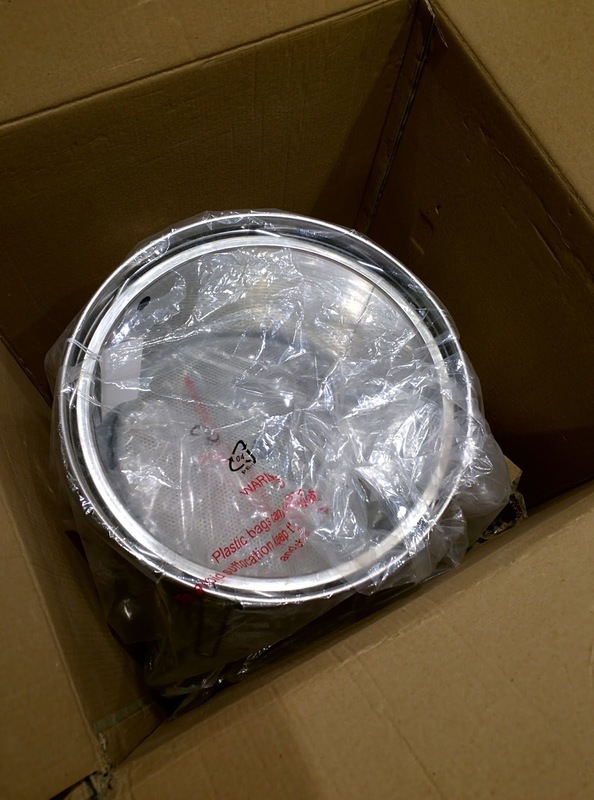 There are discrepancies between the instructions found online and in the kit, so be sure not to lose the ones in the kit as they're likely to be correct for the contents shipped to you. The above criticisms are really pretty minor. My biggest issue in the brewing process was figuring out what to do with the spices. The instructions show them being added during the boil AND being added in the secondary fermentation step. Since there was only one packet of spices provided, I had to do some digging online. Eventually, I decided to add them during secondary to ensure that I got the most aroma and flavor from them. 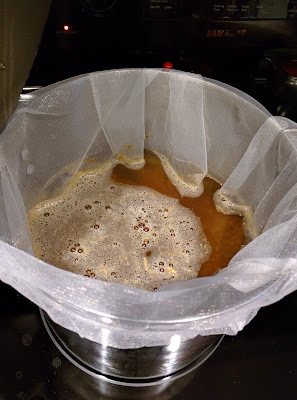 My point in mentioning these concerns is to say that for a complete novice homebrewer, these might have been very confusing or upsetting issues. All are easily fixed by adjusting the instructions slightly. It might also be good to include a hops bag in the kit, too, just to keep things easy. Overall, I'm very happy with the kit and the ease of using it. 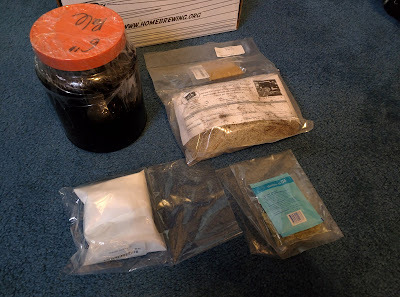 I've got a second kit to review (peanut butter stout), and I envision buying more of AIH's kits in the future. As I've noted in previous brew walkthroughs, it's my intention to detail the finished product for each beer recipe shown on this site, discuss how the beer looked and tasted, and finish with my thoughts on how I might improve the beer next time - if any. As I write this sentence, it is August 10 and I have just bottled the beer. It will condition for two weeks and be drinkable on August 24. This review is scheduled to appear online on August 30. If this paragraph is here when you read the review, it means that I've not yet chilled and tasted the beer. I'll come back and update the post at that time. Fermcap S: Although this foam-reducing agent is meant to reduce blow-off during fermentation, it's also useful during the boil to prevent boil-over. A few drops added at the start of the boil will keep foam from forming on the wort and pretty much prevent boil-over. I've been able to actually walk away from my kettle for 10-20 minutes at a time while using Fermcap. It settles out during fermentation, so there are no worries about it affecting the finished beer or head retention. Fermcap will cost around $5 a bottle, which is enough for many batches of beer. It's also useful in yeast starters to prevent blow-off. Stirring the Pot: Perhaps the cheapest solution on this list (since you probably already own a stirring spoon) is to simply stir the wort in the pot as it boils. This requires more manual effort, since you'll have to be present at the kettle to know when it needs stirring, but is very effective and could cost you nothing. Add Hops Pellets: It's said that adding 3-6 hops pellets when the wort starts to boil will reduce foaming and boil-over. Since you're probably going to be adding these anyway, it could be a no-cost solution. Kill the Heat: If you're able to lift the kettle off the heat or turn off the gas (electrics continue to provide heat when turned off), this can stop the boil and boil-over in its tracks. When the foam is gone, re-apply heat and continue the boil. Skip the Lid: You shouldn't boil wort with a lid on it. If you do, you're not allowing flavor-damaging compounds like DMS (dimethyl sulfide which gives a "cooked corn" aroma) to escape during the boil like you should. Using a lid also means that when you remove it, there's a greater chance of foam building up quickly and overflowing. If you're using a lid, stop. 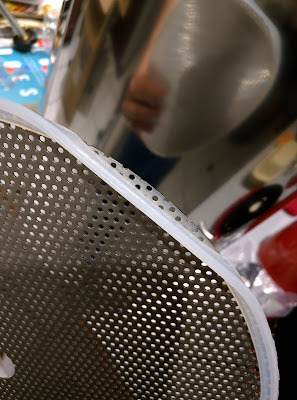 If you need to channel the steam away from a surface like your kitchen cabinets, I've found that it can be helpful to use aluminum foil to direct the steam away. I'll either create a very open "pseudo lid" that allows steam to escape in a direction that takes it away from the cabinet, or place the foil somewhere above the kettle to direct the steam away from the cabinet (e.g., in a V-shaped flap tucked in the bottom of the cabinet door). Scoop off the Foam: Some homebrewers simply scoop the foam off the top of the kettle and discard it. This is a cheap and easy technique, but if the foam is growing very quickly you may not be able to move fast enough to keep ahead of it. Spray Bottle: This is another inexpensive solution. Find a food grade spray bottle and fill it with water. When the foam starts to rise, spritz the foam with the water. This will destroy the foam, and given the small amount of water you're adding to the kettle with this approach, shouldn't lower the boil temperature. Some home brewers keep a glass full of cool water or ice cubes near the kettle and pour some in if the foam gets too high. 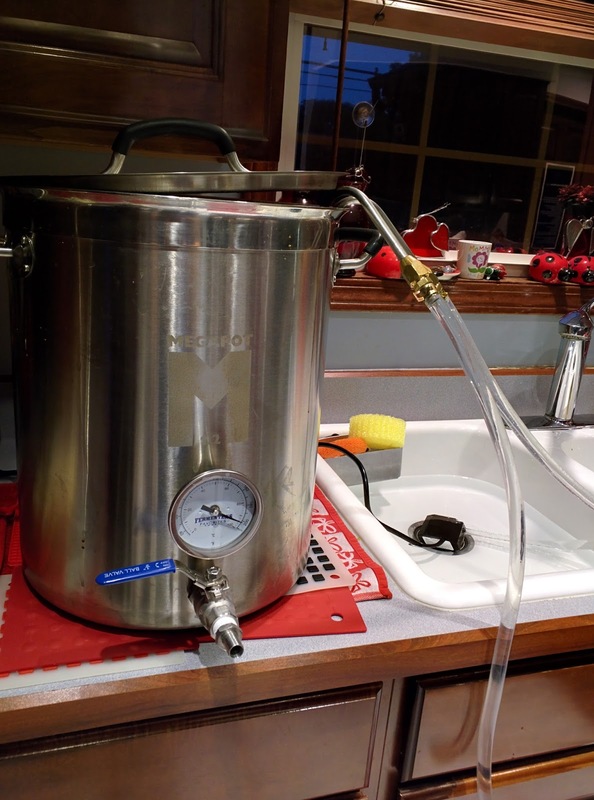 Fans: One homebrewer said that he took a computer cooling fan and mounted it on a clip, attaching it to the rim of his brew kettle during the boil. 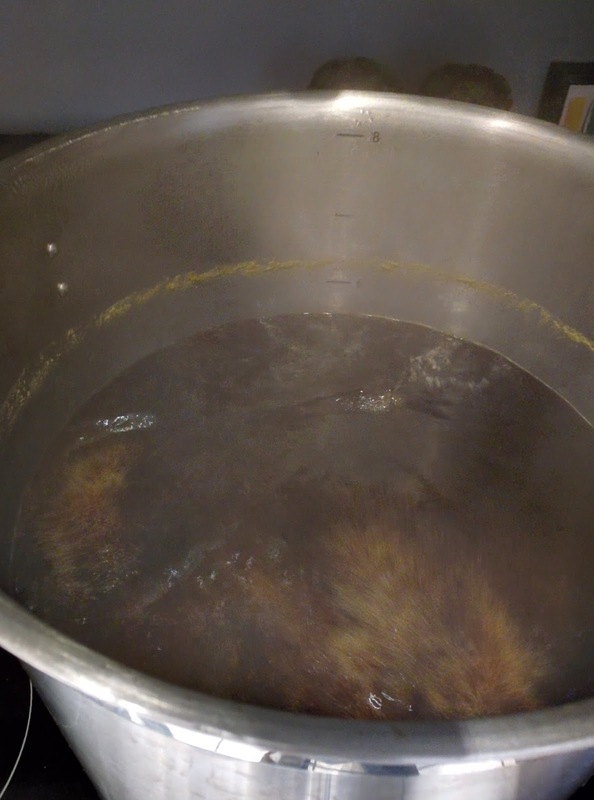 The constant action of the air blowing across the top of the wort kept boil-over from occurring. Given the price of a cooling fan and power adapter, this would be an inexpensive way to prevent boil-over. 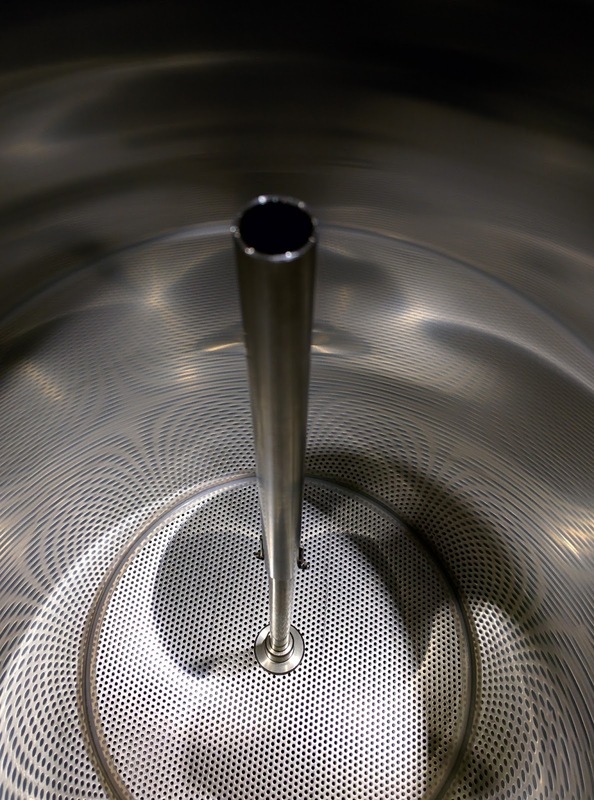 Marbles: Some brewers add 3-4 glass marbles to the bottom of the kettle at the start of the brewing process. The marbles help to split up larger bubbles that cause foaming and boil-over. Since they're made of glass, they don't melt or (assuming you clean them before use) contaminate the beer in any way. This makes them another cheap solution. Personally, I'd prefer not to put any glass inside my wort, just in case it breaks and leaves behind fragments that wind up inside a bottle... but it's your beer. Coins: For much the same reason that some brewers add marbles to the kettle to break up foam, others add 3-4 pennies or other small coins. I'm personally against this idea. Coins can be very dirty objects and have many tiny areas that might conceal something nasty. They also contain nickel, copper, and other metals that might affect your beer. Wooden Spoon: It's said that laying a wooden spoon across the top of a boiling pot will prevent boil-over. When the foam contacts the spoon, it breaks up the bubbles and keeps them from going over the side of the pot. I've never tried this, and I'm skeptical of it given how fast foam can form in some worts, but it's a simple and cheap trick if it works for you. So now you have lots of options to consider for preventing boil-over in your next batch of beer. I recently brewed a Belgian Dubbel and my third or fourth Belgian Tripel, so it seemed worthwhile to brew a Belgian table beer - sometimes referred to here in the States as a Belgian Single. The Belgian "Single" style is a lighter, more sessionable style than the Tripel or Quadrupel, due to its lower alcohol content. But like the other more-common Belgian styles, it's got plenty of flavor and complexity. I found this recipe on the E.C. Kraus brewing supply site and decided to make it. It was apparently supplied to them by David Ackley, a "beer writer, brewer, and self-described 'craft beer crusader'" who has a certificate in brewing from the Institute of Brewing and Distilling, so it ought to be a good recipe. Terminal Gravity: 1.015 (Ackley reported 1.012"
My version will be a little stronger than Ackley's, perhaps because I'm aiming for a finished volume of 5 gallons rather than 5.5. Steep the Aromatic and Biscuit malts in 1 gallon of water at 150 for 20 minutes, then remove the grain and discard. Pour the wort into the main kettle. Top the kettle with water to the 5 gallon mark. Bring the wort to a boil. Set a timer for 60-minute countdown. At 15 minutes left, add the 1.5 ounce Saaz portion. Also insert the wort chiller, add the yeast nutrient, and the whirlfloc tablet. At 5 minutes left, add the final 1 ounce portion of Saaz. When the timer is up, remove the kettle from the heat and begin pumping cool water through the wort chiller. When the wort reaches yeast pitching temperature, transfer to the fermenter. Sprinkle the yeast on top of the wort, give it a couple of minutes, then stir with a sanitized spoon to distribute it well. Close the fermenter and insert the airlock. The refractometer told me that the wort was at 14 Brix or approximately 1.061 starting gravity. I checked in on the beer about 3-4 hours after pitching the yeast, and the airlock was already bubbling nicely, so I knew my yeast was alive and working well. After a week, fermentation had stopped. I extracted a sample through the spigot and tasted it. It wasn't bad. I gave it a second week before bottling. Why Add Hops BEFORE the Boil? Those of you who love IPAs and other hop-forward styles are probably looking at the step above where I added my bittering hops BEFORE the boil began and wondering why I would do that. Most Belgian style beers are not hop-forward ales. They use hops as a counterbalance to the malt, adjunct, and yeast flavors in the beer. The idea is to have a nice balance of all the beer flavor elements without having any one of them dominate it. On each sip, I want to be able to distinguish the flavor contributions of the grain/malt bill, the esters and phenols contributed by the yeast, and the bitterness and flavor imparted by the hops. I've very recently learned there are two good ways to keep hops from dominating the beer without turning the beer into a cloying, sugary mess. (I've done that, so I look for ways to avoid it!) One way to do this, as a local pro brewer taught me, is to age the hops to mellow out their flavor. Another is to put the initial hops addition into the wort BEFORE the boil. Many brewers claim that doing this still extracts the maximum bitterness from the hops, but mellows out the intensity of the flavor. That's precisely the effect I wanted - bitterness to balance out the ale, without an intensity that would overwhelm the other flavors. This is the first time I've done this, so when I come back to this post to add the "post mortem" analysis of the finished beer, I'll tell you if it had the desired effect. 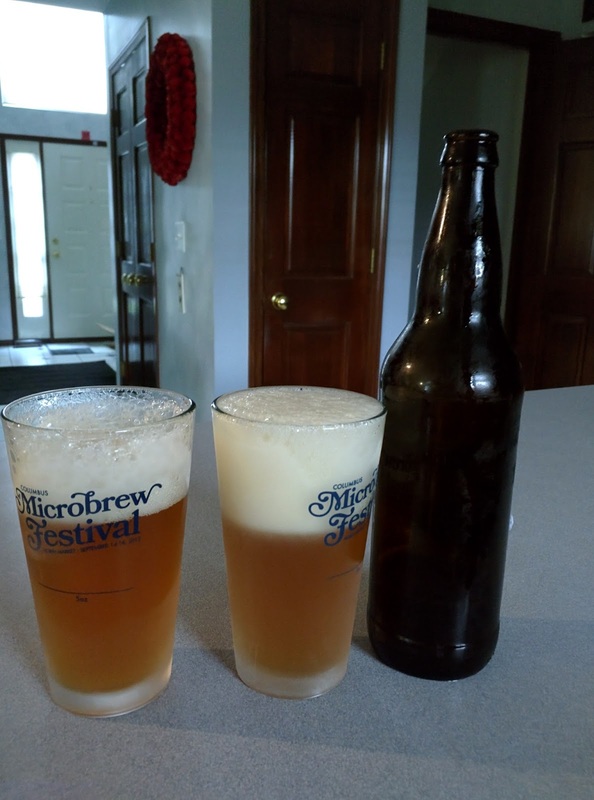 The photo at left is the finished beer, after two weeks of bottle conditioning. As you can see, it pours a hazy amber color with a nice thick white head that leaves behind spotty lacing. The aroma is mildly hoppy and malty. The flavor has a nice mix of malt sweetness, hops bitterness, and a bit of grain to it. I suspect it will mellow and improve with time as the yeast continues doing its thing in the bottle. It has a nice mouthfeel. It's not watery, but not syrupy either. It's a good balance. Overall, I'm pleased with the beer. If someone had handed me this and not told me it was a homebrew, I think I'd have mistaken it for a "professional" craft beer. That makes it the first beer I've made that I can honestly say that about. Adding the hops before the boil does seem to have given them less "bite" but no less bitterness. It seems to have made the bitterness smoother and easier to take. If I made this beer again, and I probably will, I would probably dial the bittering hops back slightly. I wouldn't drop the amount much, because it's only slightly more bitter than I'd like it to be. I'd also consider dialing back the malt bill slightly and upping the sugar content to dry it out a small amount. Below are some pictures I took during the brewing process. Specialty grains steeping in 150-degree Fahrenheit water. The finished wort being chilled in the kettle to yeast-pitching temperature, using a stainless wort chiller, sink full of cold water, and an aquarium pump... can't wait until I have a sink with a threaded end installed! 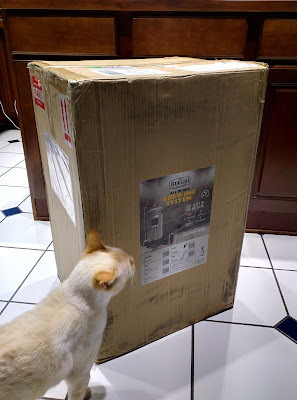 In the last post in this series, I showed you the unboxing and assembly of the Grainfather, an all-grain brewing system (pictured at left). For the most part the assembly is pretty easy to figure out and follow from the instructions provided. 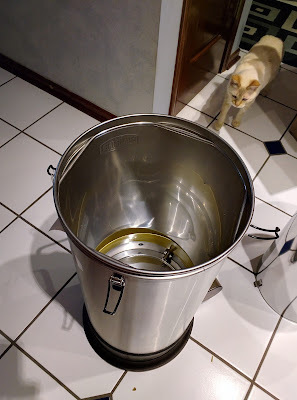 Today, I decided that I wanted to test the Grainfather out using nothing more than cleaning solution and ordinary water. I didn't want to risk a batch of ingredients to a brewing device I'd never used before. This proved to be a wise move. According to the instruction manual, the Grainfather should cleaned before its first real use. I've read reviews online where people have tried to brew with it before doing this cleaning step, and their beers tasted terrible. The manufacturer recommends their own CIP (Clean in Place) solution but says that PBW (Powdered Brewer's Wash) is a good substitute. I filled the Grainfather with a full 8-gallon load of water and added four ounces of PBW to it. I then attached the recirculating pipe and switched on the pump to make sure the PBW solution was getting moved around inside the kettle, through the pump, and eventually the counter-flow wort chiller. I also wanted to be sure nothing was leaking. All of this took about 30-40 minutes. I had the device heat the water to 131 degrees Fahrenheit as recommended in the manual. There were no leaks, the pump worked fine, and the cleaning solution did eventually reach 131 degrees. It probably didn't hurt that it was about 85 or 90 outside where I tested it. Another thing I noticed is that when you lift the splash guard to get to the controls underneath, the lid pushes up against the bracket the controller is mounted in, lifting the controller up. This isn't a showstopper, but it does make you wonder if (were you not being careful lifting it) you might pop the controller out of the bracket during a boil. After running the PBW through the system, I pumped the PBW out into a plastic fermenting bucket. This gave the bucket a nice cleaning as well. I filled the Grainfather with 8 gallons of clear water and recirculated that a bit, too. Then I filled it with six gallons and ran that through as well. How long would it take the Grainfather to boil six gallons of water? Over a 60-minute boil time, how much water would be boiled away? 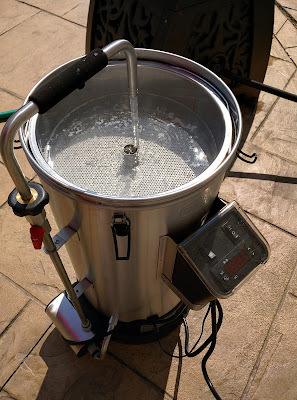 I filled the Grainfather with six gallons of water. I set the heating element mode switch to "Normal" (the setting you use for a boil, vs. the "Mash" setting for doing an all-grain mash). I then plugged in the unit and switched the control box to the "Boil" setting. Looking at my cell phone clock, the time I started this test was 5:38pm. The water showed as 85 degrees Fahrenheit. An hour later, the water had only reached 162 degrees Fahrenheit. Two hours later, just 202. When I finally gave up on it at 8:12pm (about 210 minutes later) it was still only at 209. Since I had plenty of time to waste while waiting, I started looking up reviews of the Grainfather. None of them seemed to mention how long it took the unit to boil water. I finally found one from the UK where the reviewer claimed it had reached a boil in 43 minutes. Mine hadn't boiled in five times that amount of time. Toward the end, I decided to try a couple of things to see if they helped. 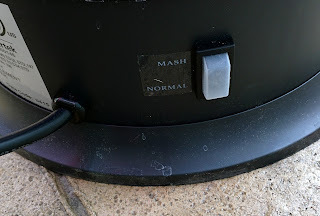 I tried unplugging the control box, setting the mode switch to Mash (thinking maybe it had been wired backwards at the factory in China) and switching it to boil. No change in results. I then tried unplugging the controller, setting it back to Normal, plugging it in, and trying the Boil switch again. No good. Since I had some "almost boiling" water to work with, I decided this would be a good time to try the counter-flow wort chiller. I set it up, hooked it to our garden hose, and turned on the spigot. The barbed connector popped out and water began spraying all over the patio. Clearly our water pressure is too high for this connector to handle. I'll need to do something about that before I try using it on an actual batch of wort. Using a lower cold water pressure kept the barb from slipping out. I then tried pumping the 209-degree water into the chiller. I opened the valve on the side of the kettle a small amount to allow only a little "simulated wort" though it. Cold water from the garden hose went the other way. The wort coming out of the "cold" end was hot enough to (mildly) burn my hands when I touched it. Clearly the counter-flow chiller needs a lot of cold water pressure and you need to dial the valve on the hot wort back to a an even lower flow than I was using. 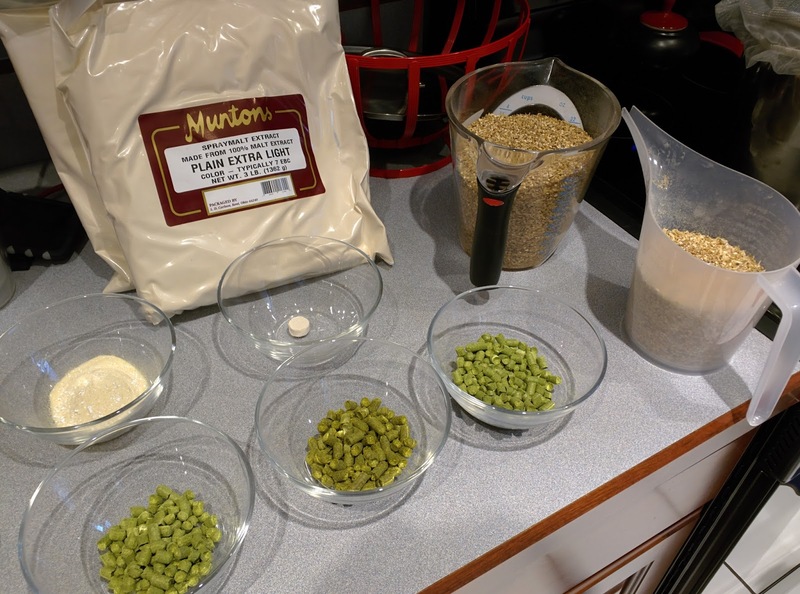 These are things I'll need to address before actually making a beer with the Grainfather. Last, it's important to note also that the valve on the discharge tube where hot wort is recirculated through the device or out through the wort chiller is made of metal. When hot wort is flowing through the tube, this valve will heat up - a lot. Be careful to use gloves to protect your hands when you adjust that valve during use. I reached out to the manufacturer to ask if this long boil time was to be expected. They contacted me the next business day and suggested that by testing outdoors I might have inadvertently activated the boil-off sensor that reduces or stops the heat if the Grainfather thinks you've boiled off your wort and are about to scorch the kettle. They suggested that it be brought indoors and tried again. A day or two later I took it to my basement, which is a consistent 68F most of the year. Again, I filled it with clean water and it registered at 73 degrees. 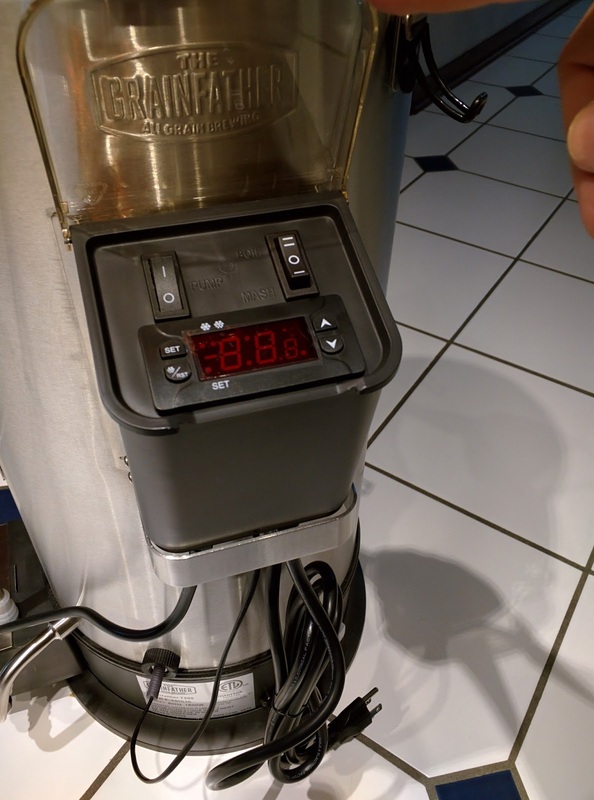 I double-checked the switches on the Grainfather and turned it on to Normal and Boil settings. This was at 7:10pm. At 9:15pm (125 minutes later) the water was at 210, and had been for about ten minutes. This seemed to be the limit of the device's ability to heat the water. I reached out to the manufacturer again, but started doing some calculations in the meantime. At 100% efficiency, a kilowatt of electricity should be able to generate around 3400 BTUs in an hour. To heat 6 gallons of water from 73 to 212 (boiling), you need roughly 6,900 BTUs of heat applied to it. That means it should have taken the device just over two hours. That seems to be in line with what I saw, so perhaps the device is working correctly and it's my expectations that are out of line. Minutes 0-15: Gather ingredients, measure, clean, etc. 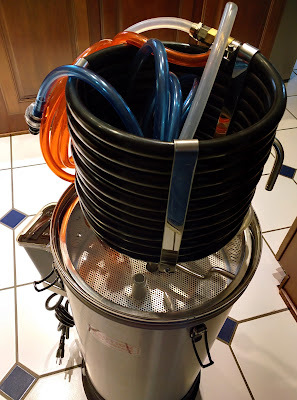 Minutes 16-75: Bring 4.5 gallons of mash water to mash temp. Minutes 76-136: Mash for an hour, ending temp around 168F. Minutes 136-140: Sparge and top water up to 5 gallons. Temp is probably around 160F at this point. Minutes 141-179: Bring 5 gallons of wort to a boil. Minutes 180-240: Boil wort, adding hops and other ingredients as appropriate. Minutes 241-250: Run wort through counter flow chiller into fermenter. Minutes 251-254: Pitch yeast, oxygenate, etc., and close fermenter. Minutes 255-279: Fill kettle with clean water, add PBW, and run cleaning cycle. Minutes 280-290: Run clean water through to rinse out PBW. Minutes 290-300: Clean everything else and put it away. That's approximately 5 hours from start to finish. Much of that time is spent getting the mash water up to temperature (nearly 60 minutes), getting the wort to a boil almost 40 minutes), and actually boiling the wort (60 minutes). I haven't compared this to a brew on my kitchen stove, but I think the stove actually boils the water a lot faster, so the time would be shorter... but that's only a guess. Note that the above are just ballpark figures based on typical recipes I have done in the past without the Grainfather in the mix, and your situation may vary (especially if you have one of the non-US Grainfather versions that runs on 240v and includes a 2000w element). I'll need to do some testing to determine how to adjust the flow of wort and cold water through the chiller to ensure that the wort comes out close to pitching temperature. In the next installment of this saga, I'll (hopefully) be walking you through a brew using the Grainfather. I may start with an extract brew because I'm most familiar with that process (even though it's not really what the Grainfather is meant to do), but I do have the ingredients for my first all-grain batch on hand and can start that when I'm sure it's all configured and working. Months ago, I encountered the Homebrew Finds blog. It's become a site that I check daily. The blog provides information about (and links to) low prices on brewing equipment, beer ingredients, books about brewing, and other related items. Through the information it provides, I've been able to score big discounts on hops pellets, ingredient kits, and pieces of equipment I wanted. Homebrew Finds is mostly a deal site, but it's more than that. You'll find reviews of equipment, tutorials on brewing techniques (like rehydrating yeast), and DIY equipment like magnetic stirrers. You'll see tips and tricks, too. Check it out the next time you're surfing the web! Recently, I brewed a Belgian Tripel. I was very careful during the brewing process to chill the beer as quickly as possible using my stainless steel wort chiller and cold/ice water. The chill process did take much longer than usual (approximately an hour) but was as fast as I could make it. When I've taken samples of the beer to measure its gravity, the samples have been unusually cloudy. This is decreasing over time, but slowly. I read about White Labs Clarity Ferm and decided it was worth a shot. I should note that this enzyme is supposed to be added at the same time yeast is pitched, not at the 3.5-week fermentation and conditioning mark where I'll be using it. Still, there is evidence to suggest that it will help clarify the beer even when used in a less-than-optimal manner. Chris Colby of the Beer and Wine Journal site did an experiment with Clarity Ferm in 2014, using the manufacturer's directions. He brewed multiple 5-gallon batches of the same two beers, then separated them into one-gallon batches. One of these was left untreated. The rest were treated with different levels of Clarity Ferm. Once the beers completed fermentation, some of the samples were primed and carbonated, and others were tested without carbonation. Laboratory equipment was used to measure gluten (protein) levels in the beer. The results were interesting. The gluten (protein) content in the treated samples was reduced to well below the 20ppm reading that characterizes "gluten free" beer. In fact, most showed virtually no detectable levels of gluten. Gluten levels dropped from 20-40ppm in the first few days of fermentation to virtually zero by the tenth day of treatment with Clarity Ferm. The untreated beers had measurable levels of gluten even at 28 days from brewing. 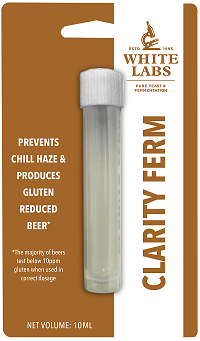 If you're gluten-sensitive and enjoy beer, Clarity Ferm may be a way to enjoy your favorite beverage without the discomfort associated with gluten. The Cream Ale was tested by 8 or more people, including a Basic Brewing Radio panel. Some tasters noticed a difference in the beers treated with high levels of Clarity Ferm, but the differences were mostly in mouthfeel. All the samples reportedly tasted good. The Stout was tested by two different groups. The first were four people who used BJCP guidelines to rate the beer. Three of the four rated the treated beer in first place and another treated beer ranked second place. A second tasting was done with nine people who had no sensory evaluation training. They were asked to identify the "different" beer (i.e., the treated one) without being told what was different. Only 2 out of the 9 correctly identified the treated beer. In other words, apart from a possible difference in mouthfeel, it appears to be almost impossible to distinguish a Clarity Ferm treated beer from an untreated one. 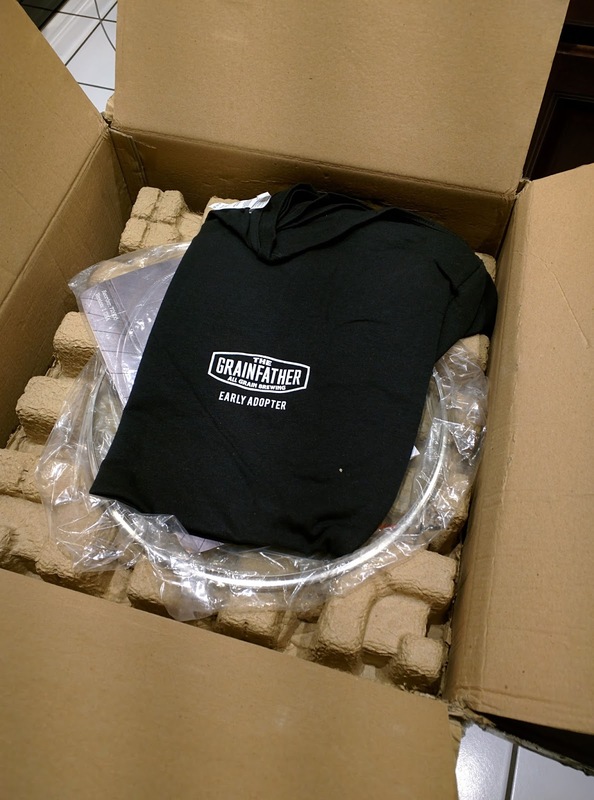 Today I received The Grainfather, a brewing system I backed on Kickstarter some time ago. Tonight, I'm going to share my initial impressions based on unboxing and assembling the the unit. When I've had time to clean it and actually use it, I'll share more. The Grainfather arrives in a large box. The box filled most of the passenger seat in my 2002 Mustang. I had to slide the seat back as far as it would go and tilt the back of the seat down as far as it would go to hold it there. Our cat Londo checking out the box. The cheek rub indicates approval. 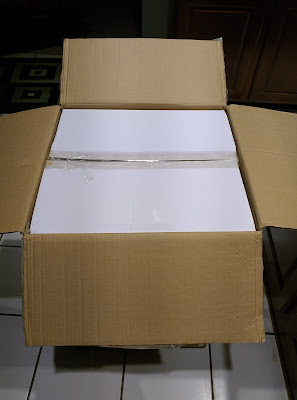 The box took a little minor damage in shipping, but was otherwise intact. Inside, I found another box. Underneath the spacer was the Grainfather unit itself, wrapped in lots of plastic. The nearly empty Grainfather. Londo checking it out. 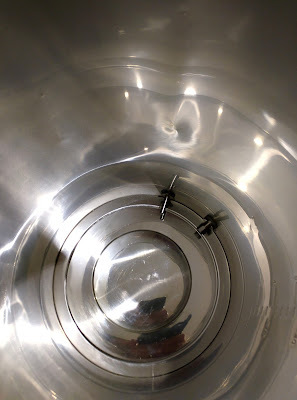 It was right here that I hit my first point of confusion with the Grainfather assembly process. In the image above, you see a yellow plastic insert at the bottom of the kettle. This is wedged into the kettle so firmly that at first I wondered if it was supposed to remain there. 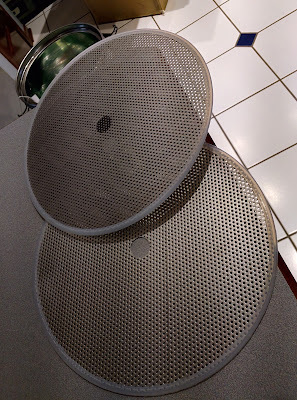 Was this intended to keep the basket from dropping down onto the thermowell or the filter? 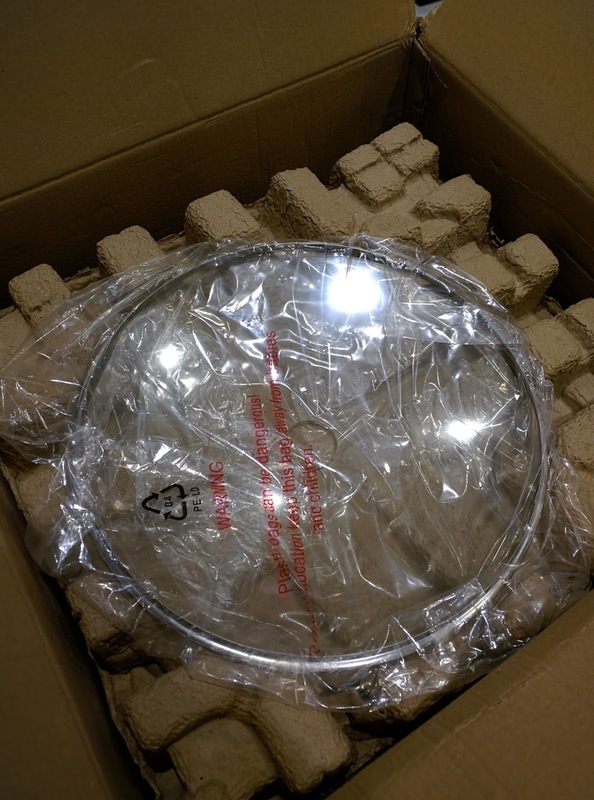 Was it there to protect those things during shipping, and needed to come out? I couldn't tell. I had to consult pictures on the manual and online to answer that question. The answer? Take it out. I installed the thermowell for the temperature control. The control box is clipped onto the side of the kettle, with the metal band underneath to support it more. This metal band also hides the plugs for the pump and heating elements which are connected to the control box using standard plugs. As you look over the unit, it's clear that the manufacturers have thought about repair and replacement of the various components. Much of what's here looks to be modular and designed to be removed and replaced if necessary. That's good. Next, I installed the discharge pipe (but didn't take pictures of that for some reason). Then I assembled the pump filter. This is another tricky bit that the instructions don't explain as well as they could. Make sure the hole in the bottom of the silicone tube is facing downward, as is barely visible here. 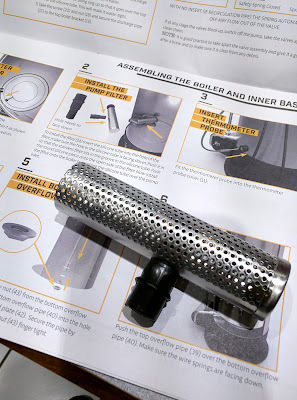 Add the silicone end cap onto the filter to seal that end of it. The kettle is pretty much configured now. The next step is to assemble the grain basket that goes inside it. This is where you'll put grain during brewing. The grain basket was a little bit of a disappointment to me. I expected it to be a single bucket-shaped piece. In fact, it's a tube-shaped piece. 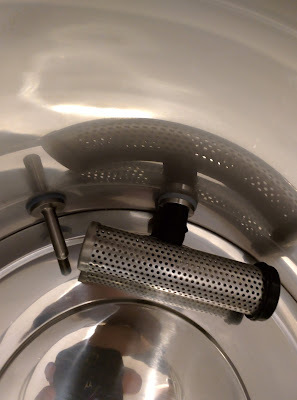 You have a round mesh with a silicone gasket around it that must be pushed down into the tube to form the bottom of the kettle. This is much harder than it sounds. The silicone gasket continually slipped off the mesh, even when I nearly had it in place and was just tamping it down. I hope this doesn't happen during the removal of a large grain load, or it might result in the grain being dumped into the kettle. That would require some filtering to ensure that it didn't get into the pump and damage it. Things were finally starting to take shape. The basket actually looked like a basket now instead of an open-ended tube. I worry a bit, too, that the overflow pipe and the loose silicone gaskets will conspire to dislodge the bottom in the future. I hope this worry is unfounded. When I went to install the "top overflow pipe" I began to think a component was missing from the box. 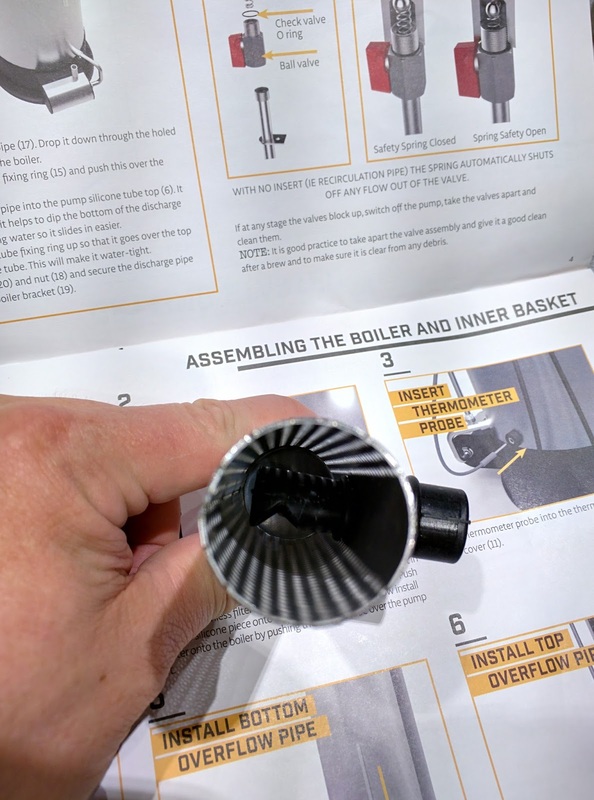 I could not find a pipe that matched the description or picture of the top overflow pipe in the items I'd removed from the box. I went through the box a couple of times to be sure, double-checked the instructions, and finally realized that it was already installed over the bottom overflow pipe. You can actually see it in the above picture. It's what the little metal spring clips are inserted into. The Grainfather instructions make it clear, as do the instructions with many stainless steel brewing products, that oils used during manufacturing can cause some very unpleasant tastes in the finished beer. The Grainfather folks recommend using their special "High Performance" cleaner before the first use and after each use. It would have been nice if they had included a sample of this in the box, at least enough of it to perform the initial cleaning. They tell you that if you cannot get ahold of their cleaner, that PBW is a great alternative. Fortunately, I do have that on hand. 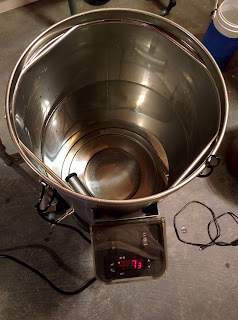 I wanted to run a cleaning cycle through the Grainfather at this point, to verify that the pump and control box are working, and to run a quick boil to verify that the heating element and control box do what they're supposed to do. I decided that doing this in the kitchen might not be the best choice, given that if something went wrong I could be spraying PBW and/or hot water all over the kitchen. Unfortunately, today's weather in Central Ohio was a bit dicey. Taking a stainless steel electrical product outside during a potential thunderstorm seemed unnecessarily risky, so I decided to put that off. Besides, I am on-call for work until Monday morning. The way my luck works, I'd get called inside to help someone just before a downpour started outside, shorting out the new Grainfather and destroying my investment before I could even use it. The instructions provided with The Grainfather are a bit inconsistent. In some areas, like the instructions surrounding the installation and assembly of the discharge pipe, the instructions are quite detailed and include several pictures. The assembly of the pump filter could have used another photo or two. Another part that could use some explanation is that the chiller is meant to sit on top of the glass lid. The lid doesn't show in the pictures in the manual, and only barely shows in my photo above. Without the lid in place, the chiller is small enough to drop into the grain basket or the boiler, which would make a mess and likely contaminate your beer. It almost seems like the chiller should mount on the side of the boiler. It also seems like it could easily slide off the glass lid during use and potentially cause problems (like spraying your nice new wort all over the place). These are mostly minor nits to pick with the device, though. It's also worth noting that many of my comments here are based just on observations made during unpacking and assembly. In real-world use the things I point out might not really matter or happen, or other things I'm not expecting could happen instead. Overall, it looks and feels well-made and as though it will be easy to service later if that becomes necessary. It would also seem like the Grainfather folks will be able to upgrade bits of it later if they want to. For example, if they wanted to switch to a touch-screen controller, you might be able to upgrade this model by just unclipping the old control module and dropping in a new one. 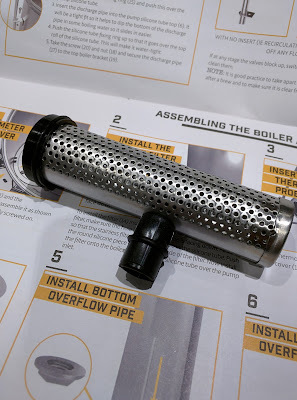 I'm glad I supported the Grainfather Kickstarter campaign, and that I have the device. I already have at least two recipes I'll use it for once I've cleaned it and checked it out. It'll probably be at least next weekend before I can put it to work on its first batch. When that happens, I'll post more photos and observations about The Grainfather and how it works for home brewing. I have a Belgian Dubbel in the fermenter that will need to be bottled soon. I wondered if Belgian Candi Syrup could be used as the priming sugar. As it turns out, you can do that. A document on the Simplicity Candi Syrup web site explains now. You need to know two things about your beer in order to do this properly. First, what volume of CO2 do you want in the beer? You can determine this from the style. My Dubbel will want something in the range of 2.3 to 2.9 Volumes. Next, what is the volume of beer you're carbonating? In my case, this is a 2.5 gallon batch. On the Simplicity Candi Syrup web site, they offer an instruction document for carbonating beer with Candi Syrup. The information below is derived from that document. I want to carbonate my 2.5 gallon batch of Dubbel to approximately 2.5-2.6 volumes of CO2, In the chart above, that means I'll need approximately 34 grams of Candi Syrup per gallon. With 2.5 gallons to carbonate, that's 85 grams of syrup by weight. With that calculation, I was ready to prime my beer. 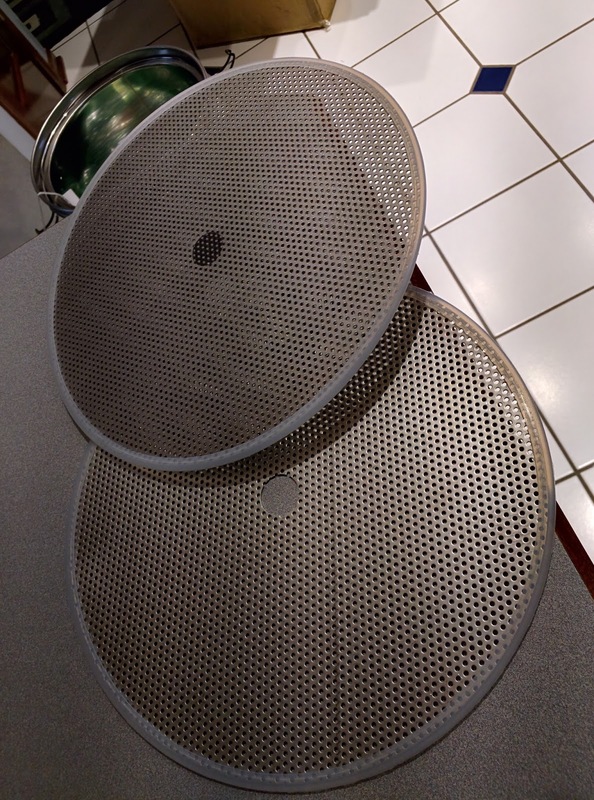 I placed a small pan with a lid on my scale and set the tare to zero. Poured candi syrup in slowly until I reached 85 grams. Reset the tare back to zero. Slowly poured in water until I hit 34 grams (actually, I overshot accidentally to 51 but decided this would be OK given the next step). Brought the mixture to a boil, which didn't take long since it was a very thin layer in the pan. Put the pan into an ice bath to cool it. Transferred the beer from the fermenter to the bottling bucket. Checked the temperature of the syrup mixture, then poured it into the bottling bucket. Stirred the contents of the bucket well to ensure a proper incorporation of syrup. Bottled and capped the beer as usual. Two weeks later, when I opened the first bottle, the Dubbel poured into the glass with a great color and a nice thick head on it. The carbonation level was comparable to a bottle of Chimay Red that I had right after it, so I think the experiment was a success! 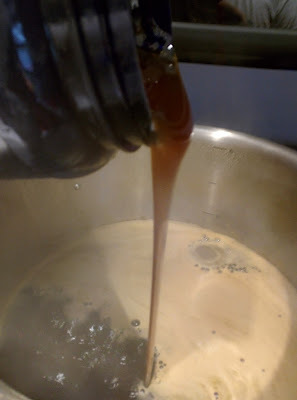 The Candi Syrup, being added near the end like this, also improved the flavor of the beer. It had been a little bland when I tasted a sample before bottling it and adding the syrup. The finished beer ended up with dark fruit elements that are common for the style.